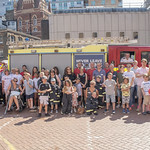 The sun was shining on families from the Encephalitis Society when we enjoyed a trip down to London for a unique event at London Fire Brigade Museum, Lambeth. My Brain: My Family on Friday, August 3, was the first of what we hope will become a regular event for families whose lives have been affected by encephalitis. The day included a once-in-a-lifetime trip along the River Thames on the London Fire Brigade Fire Boats as well as a tour of the museum where children got to meet a real-life fire dog, try their hand with a fire hose and much more. Neuropsychologists Dr Audrey Daisley, Dr Giles Yeates and Assistant Psychologist Carrie Richards also led a family resilience workshop aimed at helping mums, dads and children to better cope with the difficulties that can surround encephalitis. We have been looking at introducing something new alongside our regular events and one of our ideas was a family fun and resilience day. Feedback from our families has been fantastic and suggested that we had the right mixture of fun and useful information to give mums, dads and children the tools to better cope with any difficulties that may come with having a family member who has been affected by encephalitis. It also helped for the children to spend some time in the company of firefighters who face tough challenges on a day-to-day basis. Working with children and young people who are also facing tough times is such an important part of our work and we desperately need to offer more opportunities like this where families can learn how to become more resilient when serious illness strikes. As a small charity with very limited resources, we are so very grateful to the London Fire Brigade for their support and if any other organisations or companies would like to get involved with our work helping children affected by encephalitis, then please get in touch. The visit to the museum was organised facilitated by our Trustee Fiona Twycross, a Deputy Mayor of London. We are very grateful to Fiona and to Jane and Chris and the rest of the team at the fire station itself who went above and beyond in making it such a fantastic event for our families. We will definitely be looking at holding future events up and down the country in the future. The Encephalitis Society would also like to thank member Paul Wicks, of Blind Luck Photography, who documented our visit to London, Moore Blatch Solicitors who helped to fund the event and Tate-Smith's Limited for kindly providing the drinks.